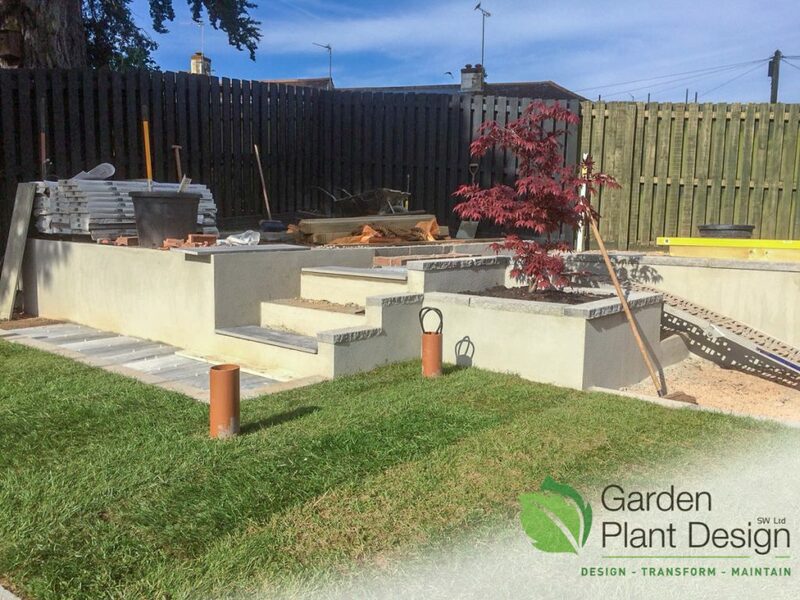 Garden Plant Design showcase a project from May/June ’18. 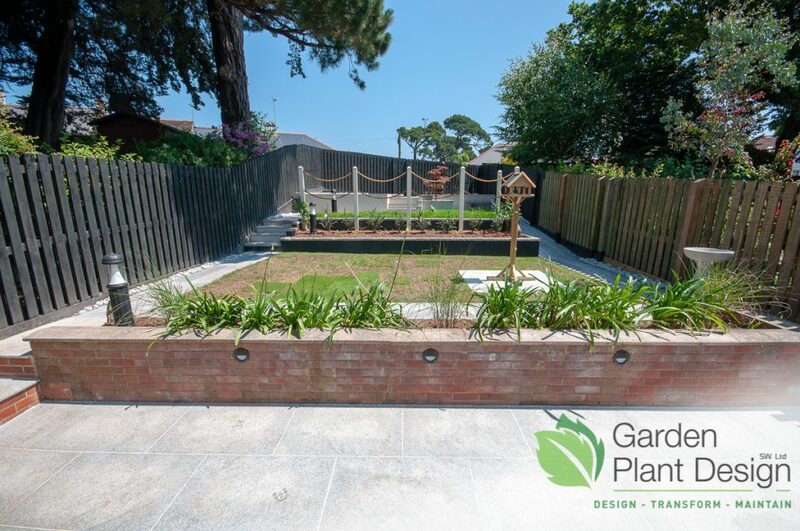 The initial contact was from our clients for us to design and construct a whole new landscaped garden in Paignton, Devon. Our friends at Fine Design provided the concept plan. 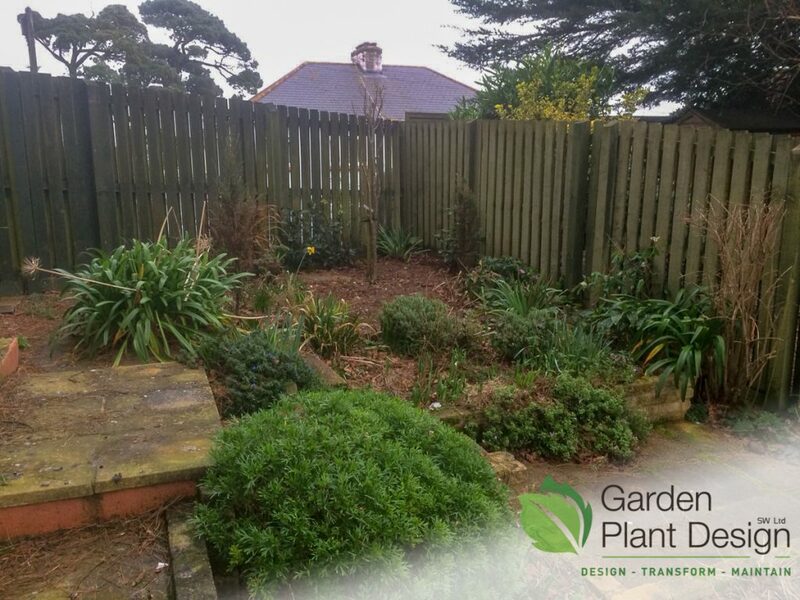 To clear complete garden of trees and shrubs. 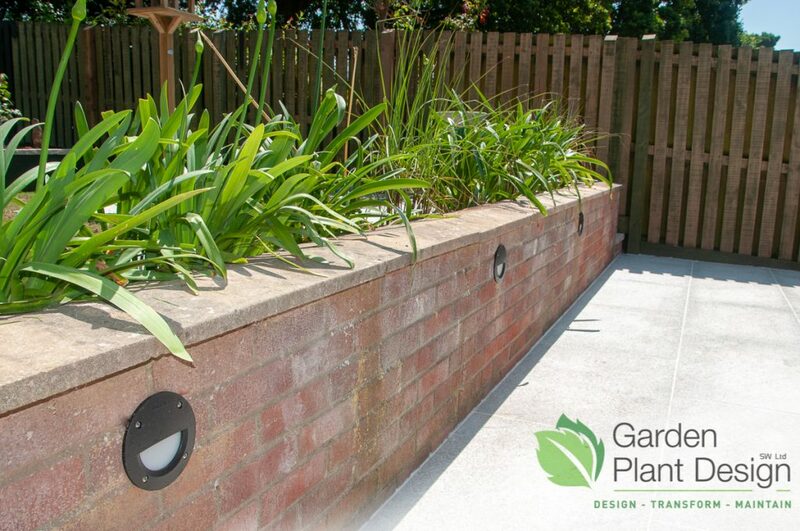 To build up, support or replace retaining walls to the correct heights. 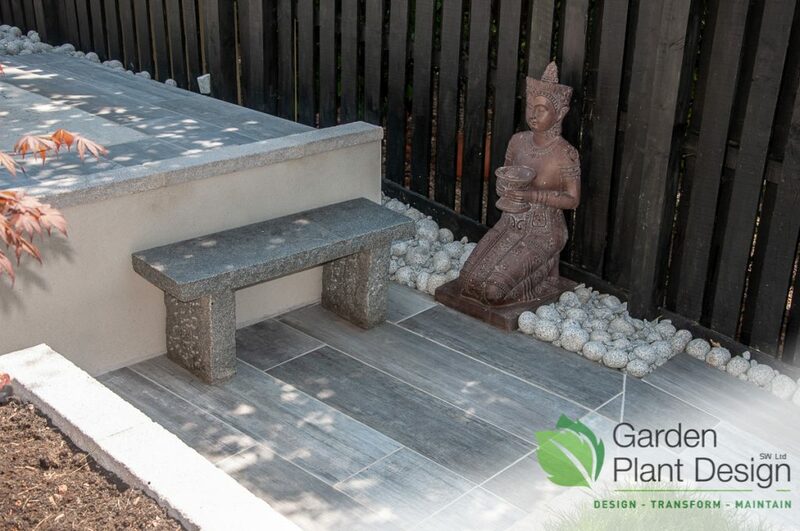 To construct a patio area from granite slabs. 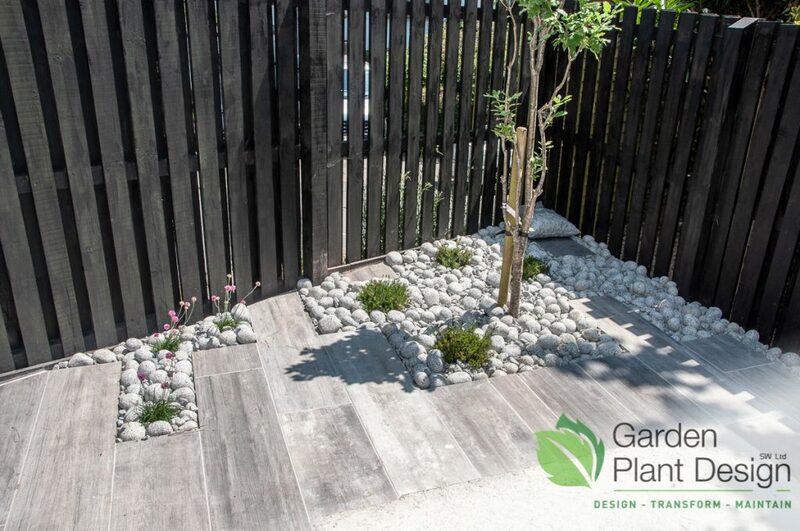 To construct pathways from porcelain planks. Custom log cabin giving extra living space for the warmer months. Gazebo housing a hot tub – Giving extra privacy. 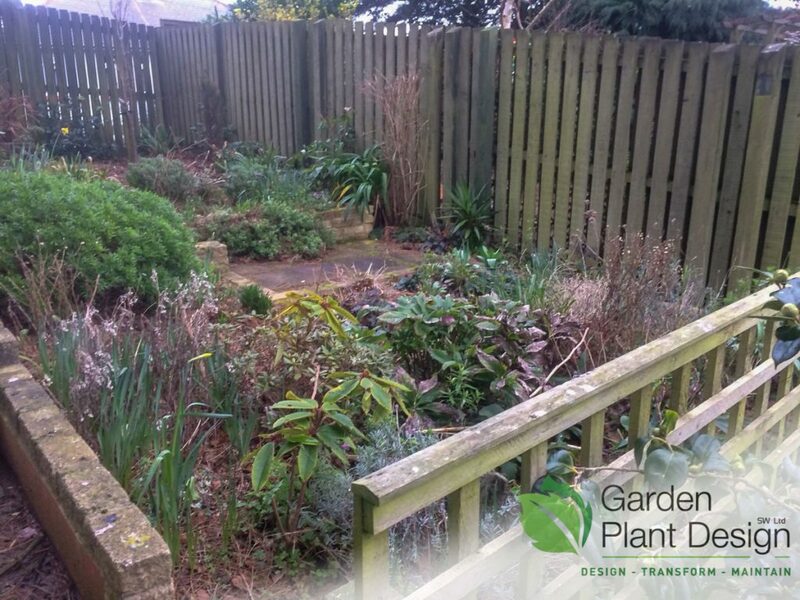 Shrubs and Hedges designed to encourage wildlife. 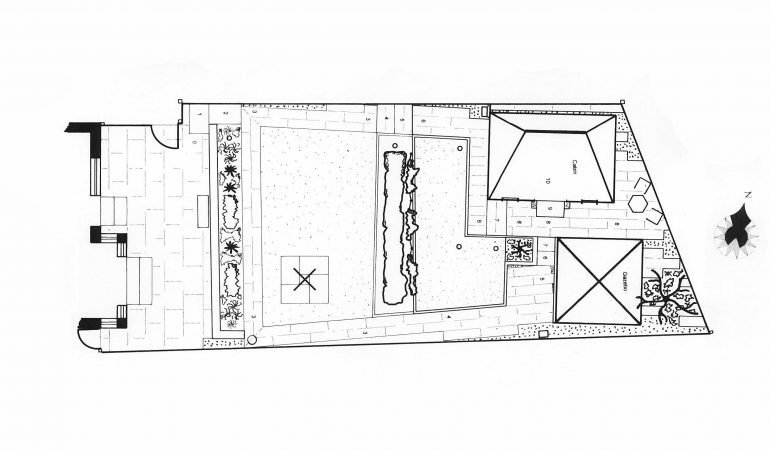 A functional and social space. 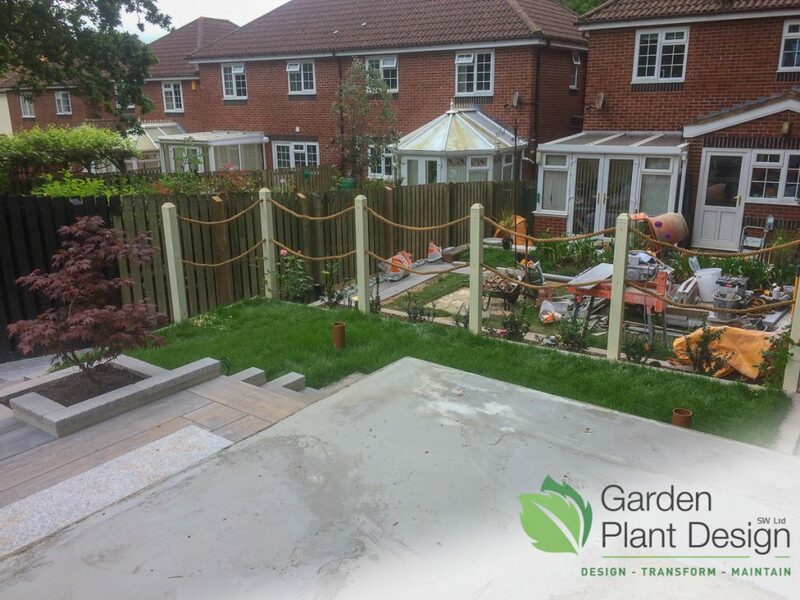 The lower steps to be removed and new steps to be constructed next to the fence. 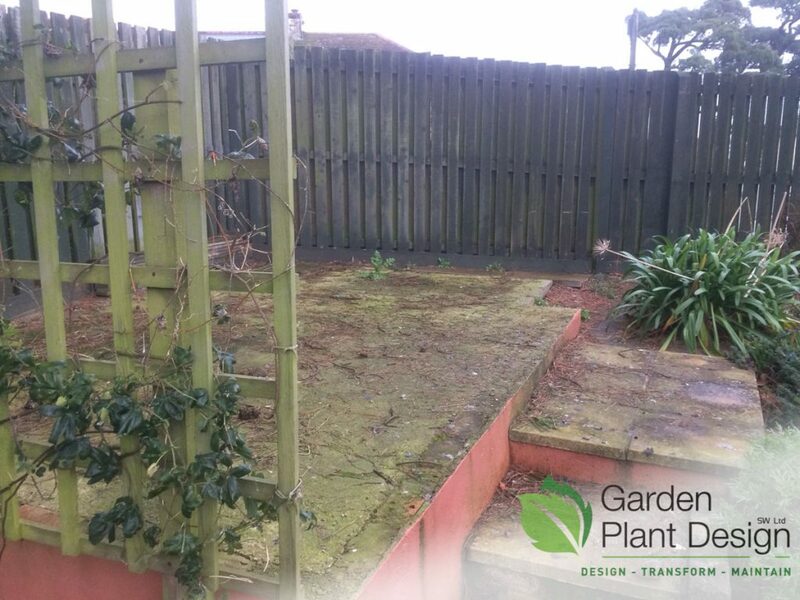 Trellis, pergola and plants to be removed also. 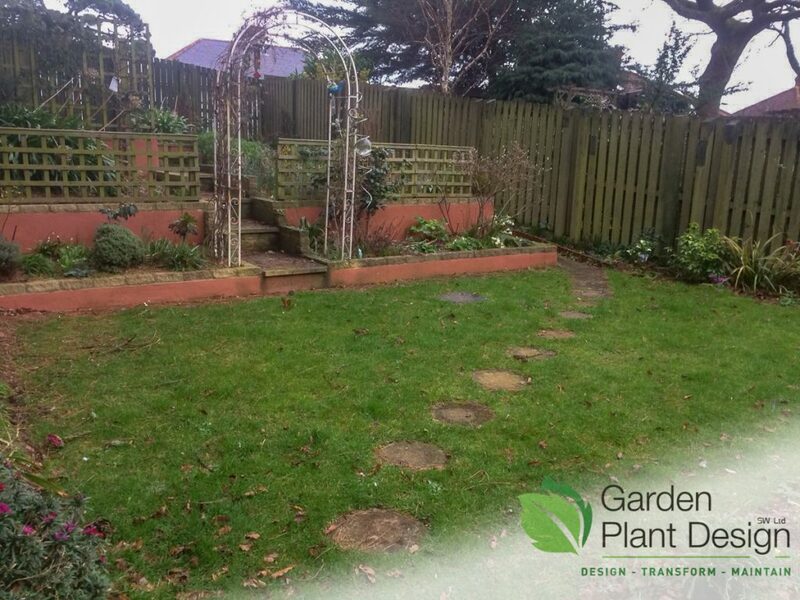 To remove all plants and shrubs except for a protected oak tree and the rear of the garden. 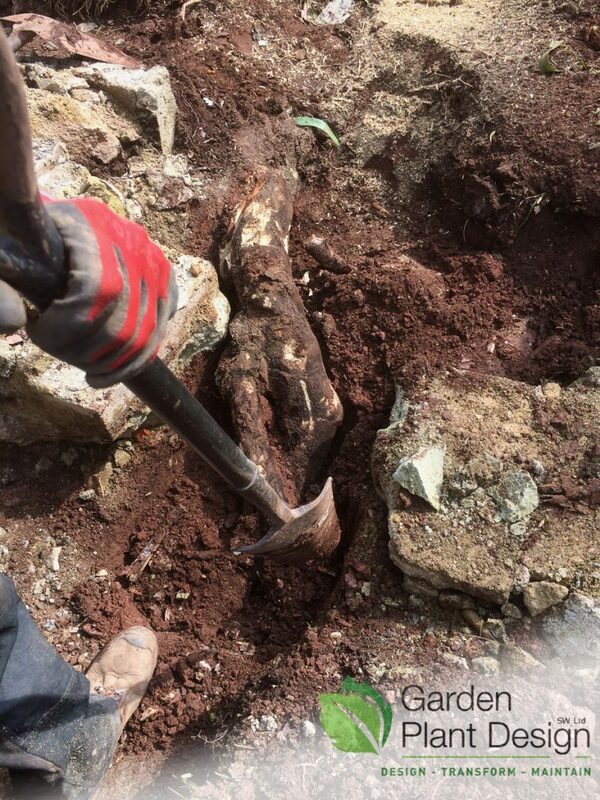 It wasn’t until we had cleared all the foliage and rubble and started on the foundations that we realised that at least two very large stumps were buried under the surface. The roots seemed to follow exactly where we needed to dig the foundations! 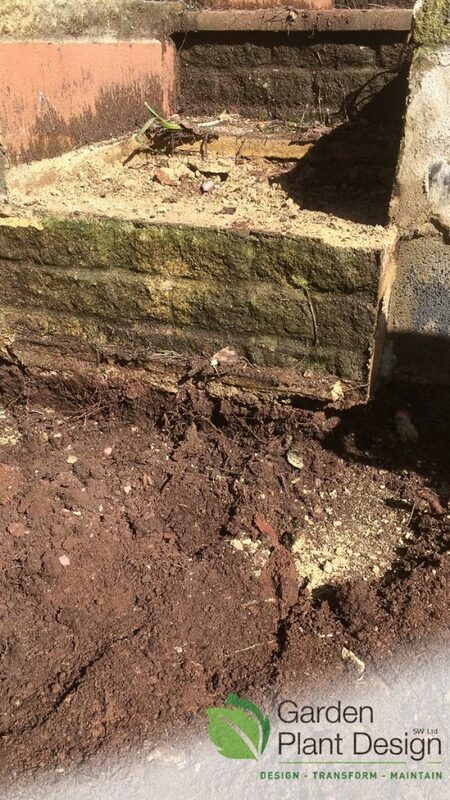 Digging down to find the foundations of the existing wall only to find there weren’t any!… not that would hold a 900mm high retaining wall. The walls are all up and scratch coat ready from rendering. 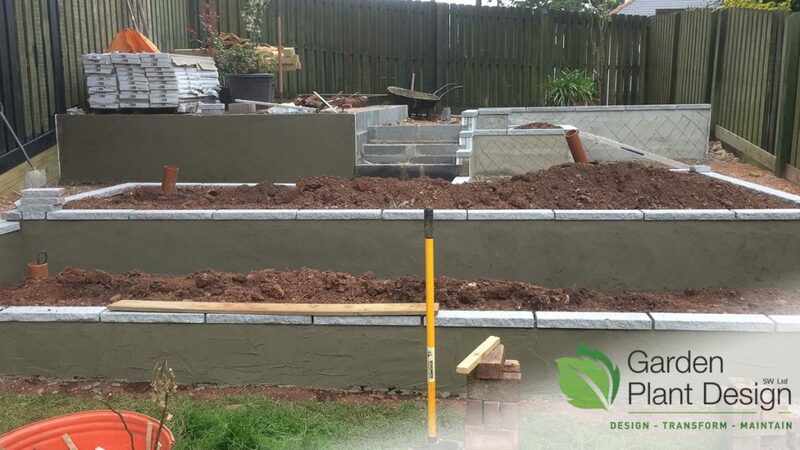 Rendering complete and just about dry the our clients to paint. 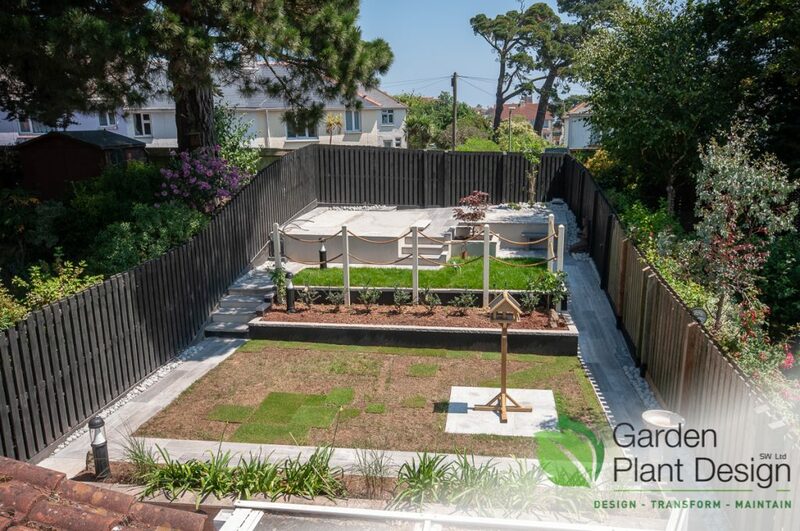 Raised lawn turf is laid and all electric cables in for Bollard light to be fitted. 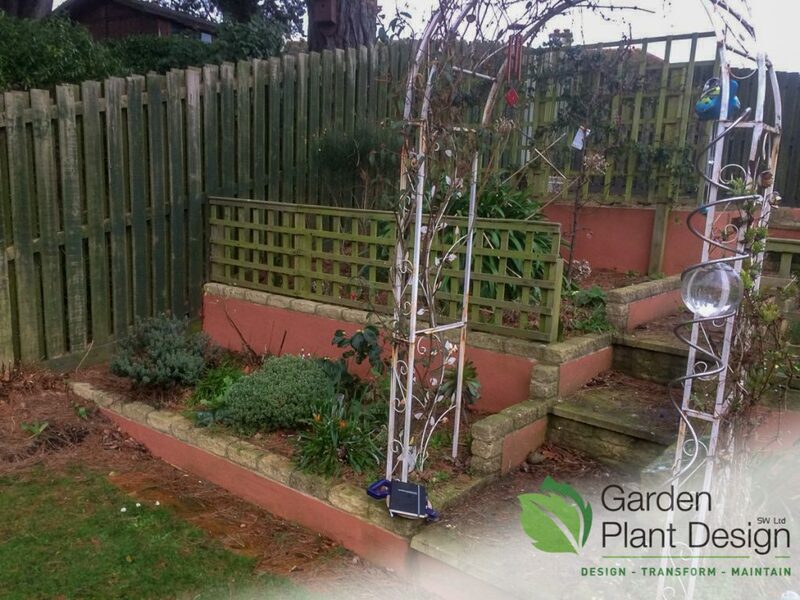 Raised bed filled and the clients own beautifully shaped Acer planted. Posts fixed in place with authentic nautical rope swags. 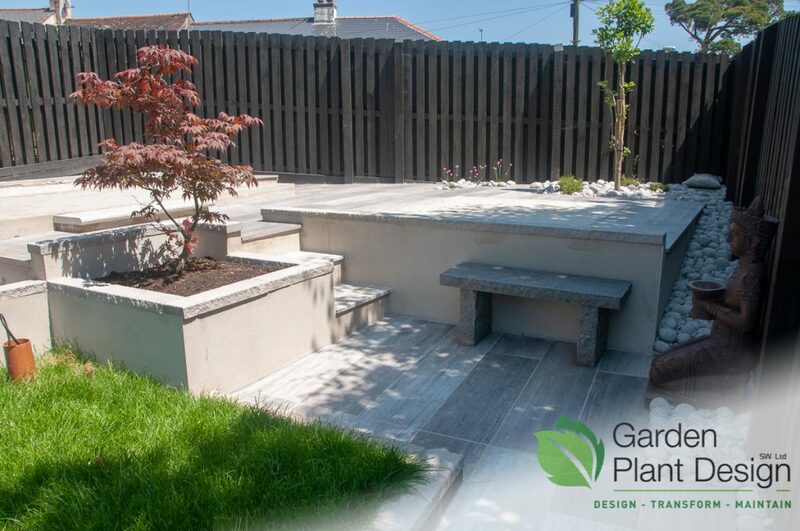 The first few plants are planted surrounded with 70-90mm granite cobbles and 20-50mm rolled granite stones to finish. Inspection chamber carefully cut out of the granite slabs. 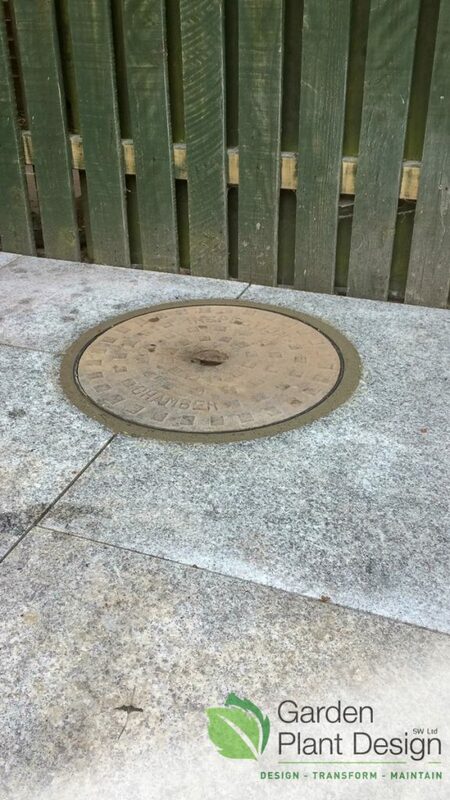 Chamber raised and refitted. 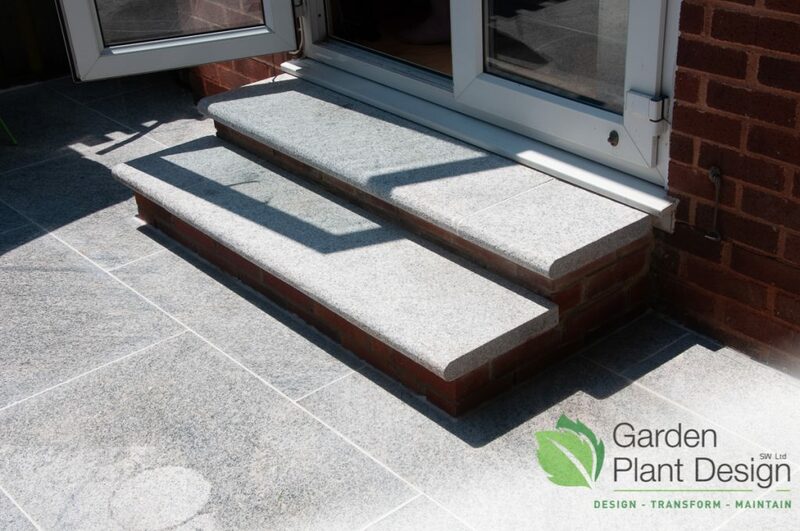 Old steps taken out and resized with new custom 50mm bullnose granite tops. 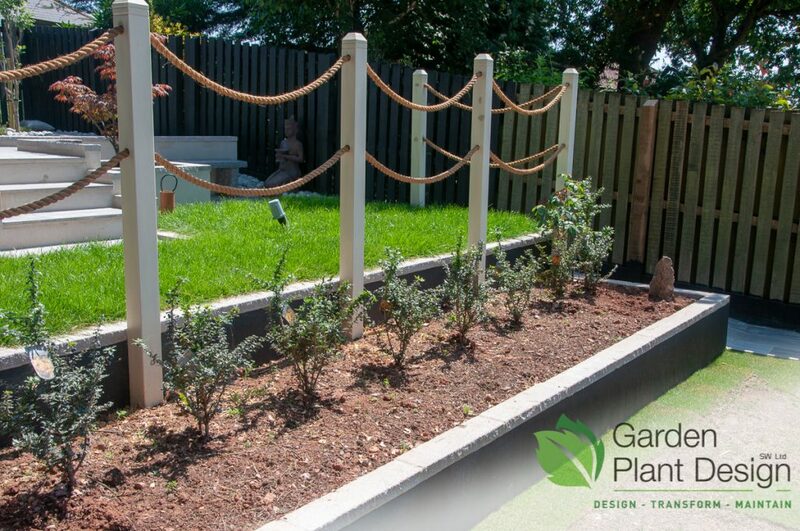 Climbing roses and Berberis planted to eventually become a 1200mm (4′) hedge. Grouting complete using KeraKoll Fugalite ECO. Tricky to lay in 25°C + temperature but we nailed it! 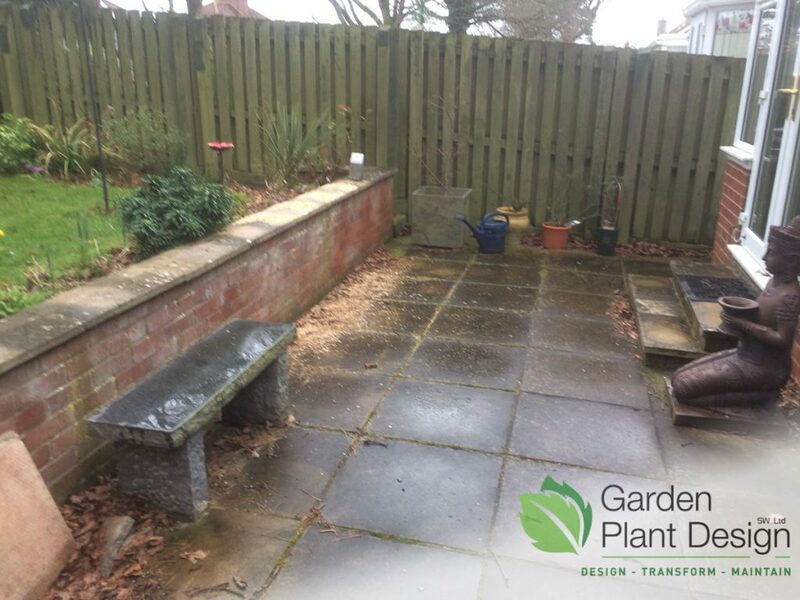 Clients own Statue and seat added for decoration. Mission Complete!.. Well, for us anyway. Now awaiting a 2.7m x 4m custom log cabin, a 2.7m x 2.7m Gazebo and a hot tub. We will update you with the finished pictures at a later date. 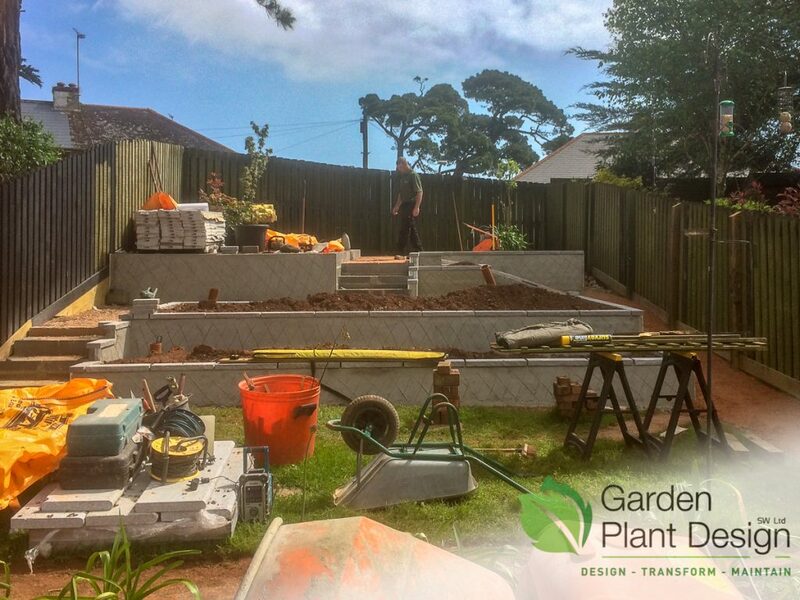 Garden Plant Design (SW) Ltd providing Garden Landscaping Services in Torbay, Exeter and throughout Devon and the South West. 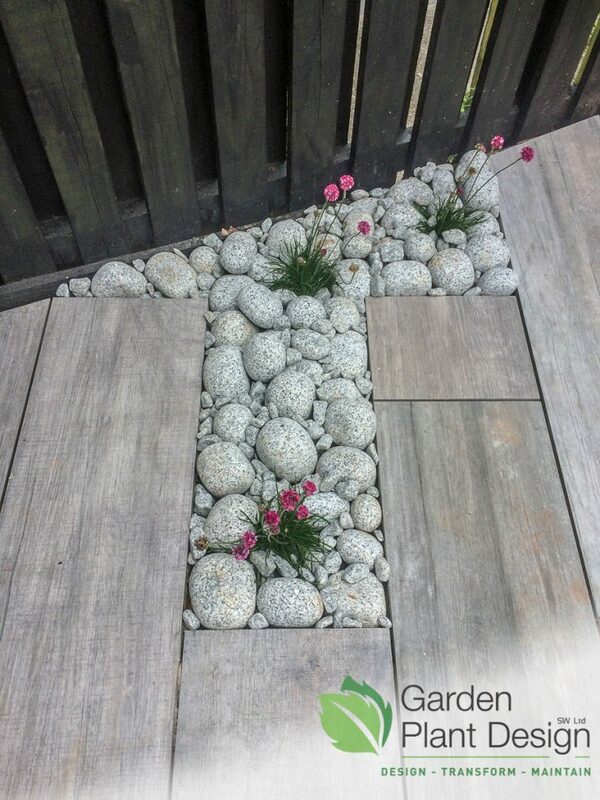 Please contact us for further information to discuss your Garden Landscaping Services requirements. Garden Plant Design © 2019 All Rights Reserved.